Welcome to my web site, Freshwaterphil.com. I'm just another fishing addict, living in Montreal. Like thousands of serious anglers, I'm passionate about my favorite pastime, and love to share tips, tricks and information with anyone from amateurs to professional fishermen. I live in the city of Montreal, which is in the Canadian province of Quebec. Canada is blessed with millions of lakes, rivers and streams, there are a few hundred thousand in Quebec alone. 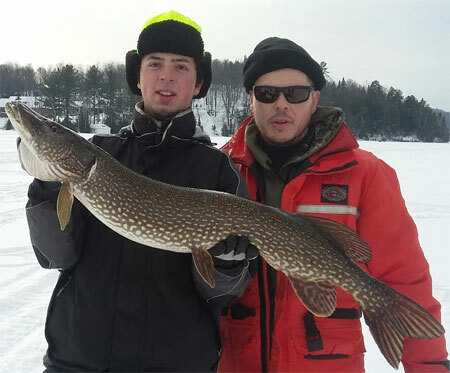 Living in Montreal, which is located in the Southwestern section of the province of Quebec, I also have the privilege of fishing in Ontario quite often, occasionally New York and Vermont as well. I've been fishing since the age of 3, but only got into serious angling in my twenties, when I started having children. Today, my kids share my passion for sport fishing, I try to take them along as often as I can. As Montreal is an island, I typically fish Montreal's surrounding waters of the St Lawrence River (Lac St Louis, Lac St Francois) and it's tributaries, as well as the Outaouais River (Lac des Deux Montagnes) and the Ontario portion of Lake St Francis (St Lawrence River). All are less than 1 hours drive from Montreal, great places to fish, and home of some of the hottest bass, musky, carp, and sturgeon fishing in this part of the country. I consider myself a multi species fisherman. Whether I'm casting topwater lures for a early morning or evening bite on a calm lake, still fishing with boilies or soaked corn for carp, trolling for walleyes/muskies or night fishing for channel cats, their is nothing more that I enjoy than the soothing / calming effect of the water, interrupted only by the adrenaline rush of a hookup and the ensuing battle. I spend a lot of time researching fishing related ideas online, and have many friends in the industry, ranging from professional fishing guides and outfitters to tackle dealers to bloggers and other members of the online fishing community. 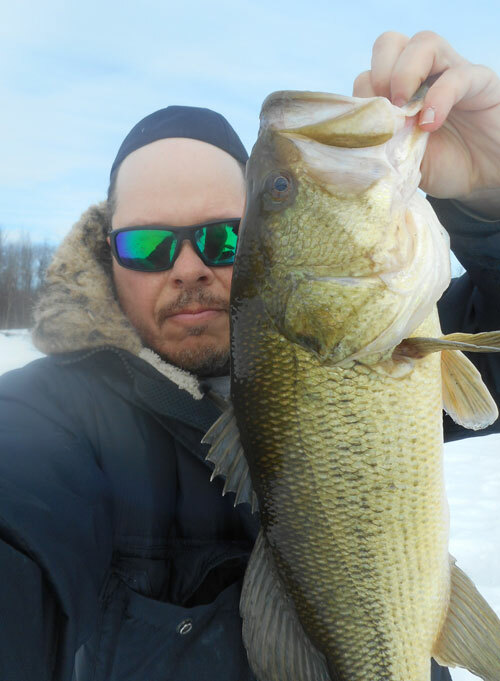 If you're looking for a local fishing guide in the Montreal area, click here to view my recommendations. Shore fishing is one of the most relaxing and economic ways to fish. Shore fishing is often overlooked by many fishermen, especially fishermen looking to catch big numbers of game fish / predatory species. Depending on the species targeted and the season, effective methods are casting, jigging and still fishing. 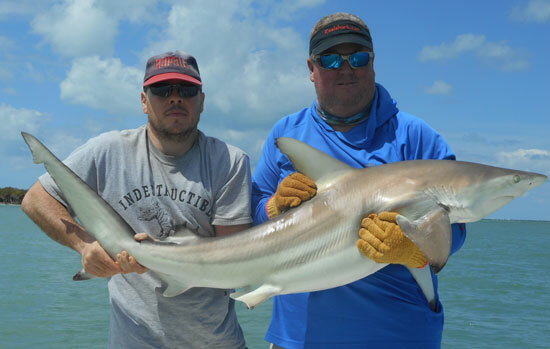 The key to good shore fishing is to try many spots during the course of a given season. Eventually, you’ll figure out which spots produce best at which times, greatly improving your success ratio. Shore fishing is also a good way to meet other anglers that fish the spots, possibly share tips and experiences with them. While many lakes or remote waterways don’t offer much shore fishing access, the rivers and waterways around Montreal do. Hundreds of kilometers of fishable shoreline, much of it accessible by foot, bike, public transit or car. Shore fishing is ideal for short outings when hauling, launching and landing a boat isn’t feasible, and also great if you’re going to be fishing with young kids that may get restless sitting in a boat for too long. I’ve caught most of my biggest fish from the shore, and know many others that have done so as well. If you’re looking for good shore fishing spots around Montreal, I suggest you get a copy of my shore fishing guide by clicking here. Fishermen have been using boats to catch fish for thousands of years. Having a boat to fish from allows the angler to access fishing hot spots as long as the water remains fluid. Up until a few years ago, fishing from a boat remained quite simple. Modern fishing boats come with a wide array of accessories, geared towards improving the total fishing experience. From high powered engines that will get you from spot to spot in no time, to trolling motors that allow you to silently work a shoreline. From sonars / depth finders that allow you to see the bottom (and fish) to GPS units that allow you to mark you hotspots or plug in a pre-programmed lake map. Many fishing boats cost more than the cars or trucks that are hauling them around. The waterways around Montreal offer almost no boat rental opportunities. Many dedicated fishermen here own their own boats. 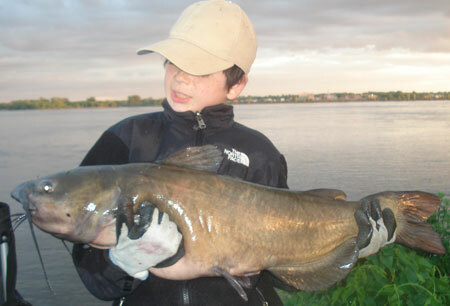 With a river the size of the St Lawrence, the fishing possibilities around town are overwhelming and virtually endless. Finding good spots and techniques that work can take years for an un-experienced fisherman. Whenever I hear of a fisherman having trouble catching a given species with his boat, I suggest hiring a fishing guide for an outing or two. For a fraction of his (or hers) yearly fishing budget, they can eliminate a huge amount of guesswork and wasted time. I know some very good guides that can put people onto trophy fish, as well as teach them techniques and show them many local fishing hot spots. To view my list of recommended fishing guides, click here. Each species has it's specific thrill. Largemouth bass and smallmouth bass are very numerous, grow to decent sizes and offer some of the best pound for pound action of any freshwater fish. Their willingness to take a huge variety of lures and baits on a multitude of setups makes them easy to catch. They are among my kids favorites as well, and as we often top 50 bass per day, they don't have enough time to get bored. My favorite bass lures are Rebel Pop-R, Arbogast Jitterbug, Heddon Zara Spook Jointed floating Rapalas and Rapala Countdowns. Largemouth bass are more of a warmer water fish than smallmouth bass. Accordingly, their range in Canada is limited to Southwestern Quebec and Southern Ontario. Due largely to the popular American Largemouth bass fishing culture (fishing magazines, TV shows and tournaments), Largemouth bass fishing in Canada is becoming very popular. The huge bucketmouths make for explosive topwater strikes, and enable them to take bigger lures than Smallmouth bass of the same size. Their thick girth and heads makes for impressive pictures as well. Largemouth bass prefer shallow water year round. They related well to structure such as heavy weed cover and sunken logs. When they are active, they’ll take a variety of lures such as spinnerbaits, crankbaits, jerkbaits and topwater lures. When they are less active, artificial plastics lures such as frogs, big worms and lizards fished very slowly will often be necessary to catch them. Smallmouth bass prefer cooler water than Largemouth bass. Accordingly, they have a wider range in Canada, stretching from the Maritimes into the Prairies, and reaching further North than Largemouth as well. Smallmouth bass are spectacular, relentless fighters. They jump, tail dance and seem to never give up. 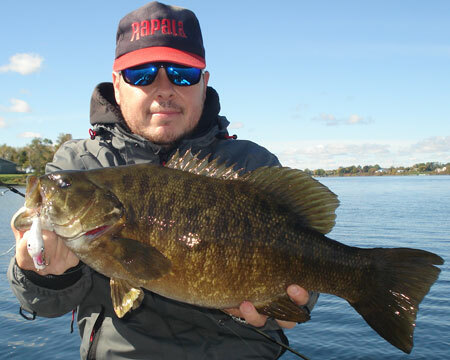 Smallmouth bass are more abundant and fare better in our waters. 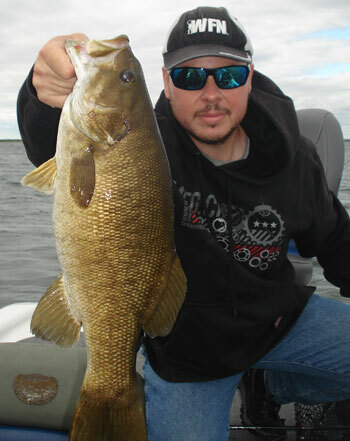 Most Canadian bass tournaments are won mainly on Smallmouth bass. Smallmouth bass move in and out of deeper water all through the season. They can be caught in 1-2 feet on some days, and 40 feet on other days. They relate well to rock structure, often foraging for crayfish and gobies under the rocks. When active, they’ll hit minnow baits, crankbaits, topwater lures and spinners. When they are less active, switch to jigs or drop shot rigs. They seem to hit better on live bait (worms, leeches) than largemouth bass. 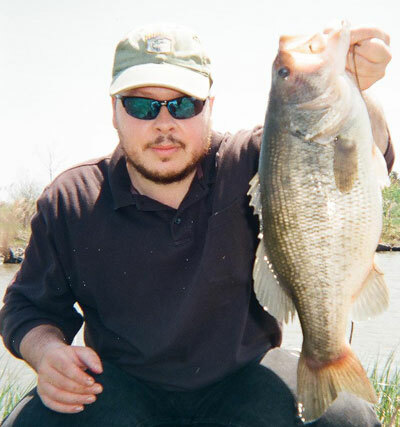 Jimmy and Mark both offer guided bass fishing trips, contact them by clicking here. Northern pike are another favorites with my kids. 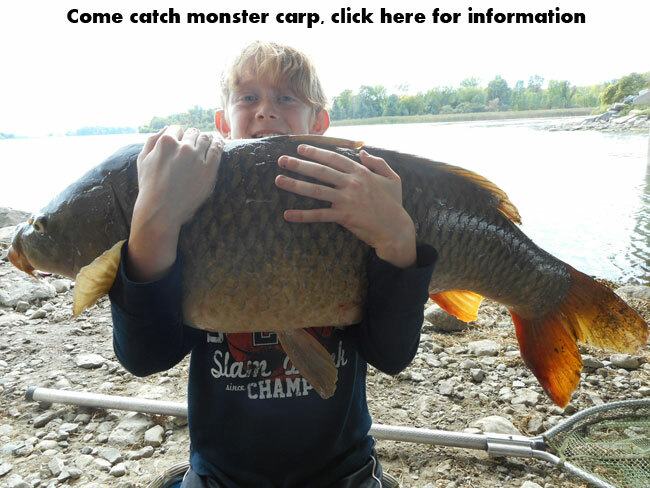 As with most kids, seeing a big fish with lots of sharp teeth, has an effect on them that no other fish does. Though most pike around the area are under 6 lbs, there is always a chance for some up to 15 lbs as well. My prefered technique is is casting for pike with spinnerbaits, occasionally I use Rapala X-raps, Countdowns, Smithwick Rogues and spoons such as the Daredevle or Williams Wabbler. Occasionally, I'll troll for pike using Rapala Husky Jerks, X-raps or Countdowns. 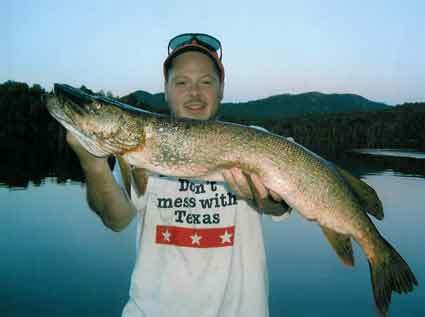 Big pike will relate to shallow water throughout the winter and spring. As the water begins to warm up after ice out, they’ll often be found sunning themselves in shallow bays. This is by far the best time to catch monster pike. 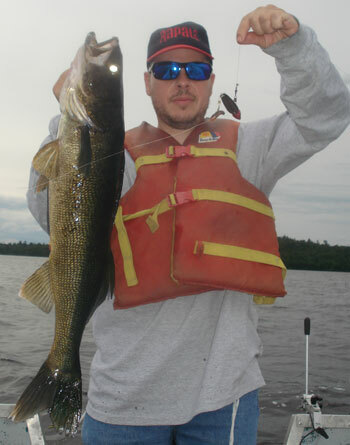 As the temperature warms up, bigger pike will move to deeper water moving shallow only to feed. Smaller pike will move into heavy weed cover feeding throughout the day. 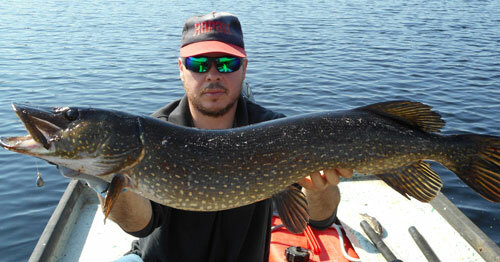 Jimmy and Mark both offer guided pike fishing trips, contact them by clicking here. Though walleye aren't the best fighters, they are a great eating fish. This makes them once of the most sought after species of game fish in the waters surrounding Montreal, and are abundant in the St Lawrence and Outaouais rivers. During the spring, I catch bigger walleye trolling shallow running lures, or casting crankbaits such as the Wally Diver and smaller Rapala countdowns. Jig and grub combinations are great in swift current. Later in the season, I fish for walleye suing drop shot or jigging techiniques. Walleye feed year round, so they are caught through the ice as well. 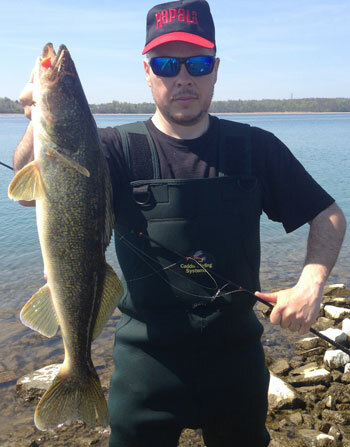 Mike and Mark offer guided walleye fishing trips, contact them by clicking here. 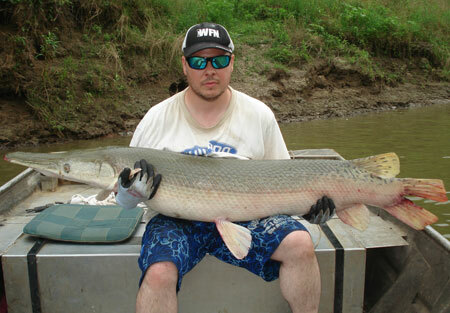 Musky fishing is the top of the Freshwater game fishing mountain, as muskies are the top freshwater predator in this part of the country. Muskies grow to record sizes in both the St Lawrence and Ottawa rivers, 2 of the waterways bordering the island of Montreal. Both are world class fisheries for trophy musky fishing. 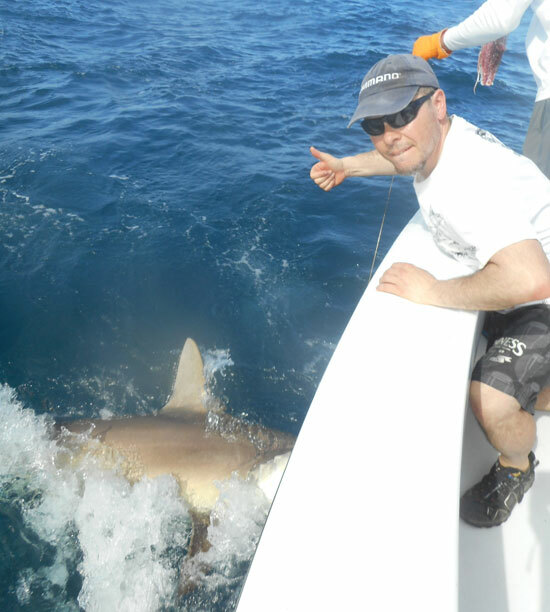 They are also quite large, a big boat and highly specialized equipment is required to fish them properly. 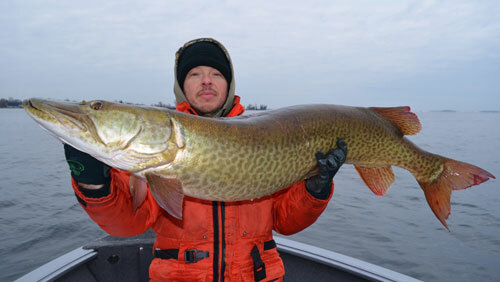 As I don't own any musky gear or a boat (let alone one large enough to troll our waterways), my musky fishing is limited to occasional shore fishing, or going out to hunt giant muskies with my friend "Musky" Mike, one of the top musky fishing guides in Canada. 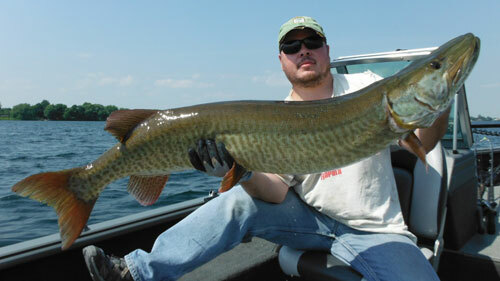 Mike offers guided musky fishing trips, contact him by clicking here. 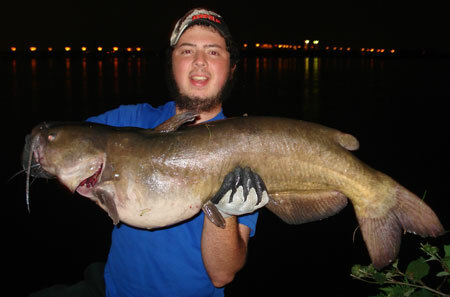 Still fishing for species of big bottom feeders such as carp, catfish and sturgeon, is both relaxing and exciting. A quite relaxing outing goes from "zero to sixty in one second" as soons as the baitrunner starts screaming. 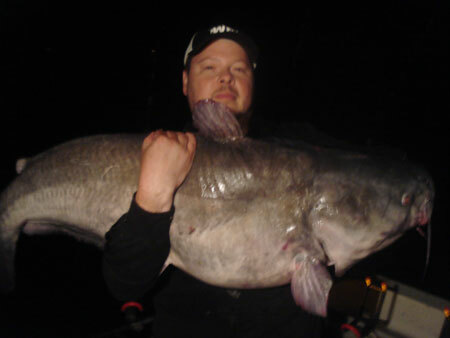 I typically use 8 foot rods for channel cats and sturgeon, 9-12 foot rods for carp. 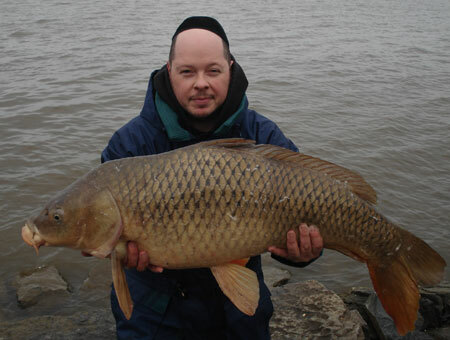 Carp fishing is gaining popularity in Canada. Though many practicing the sport of carping are Europeans, many native born Canadians such as myself have joined the craze over the past decade. Carp are bigger and stronger than most other freshwater species around here. Their shear numbers combined with them being a species that is caught shore fishing in public waters, make them easily accessible to all. I do much of my carp fishing in the world famous Long Sault region of St Lawrence River, Canada's carper Mecca. Every year, hundreds of international anglers fly in to fish these carp filled waters, located about 1 hour's drive from my house. I typically use boilies set up on hair rigs for bait, occasionally using corn nibblets as well. Proper chumming is essential. 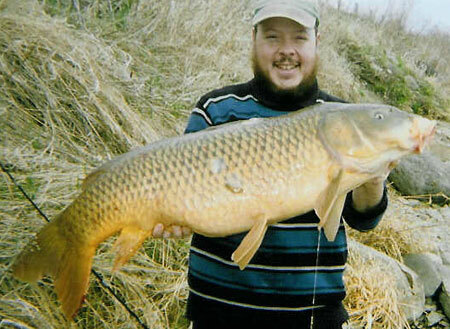 Carp are the only species I currently offer guided outings for. If you want to hook and land some of these tackle busting beasts, contact me by clicking here. Channel Catfish are abundant and quite easy to catch when they're feeding. During the spring, they aren't very active, then in the summer, they tend to start feeding near dusk and throughout portions of the night. I used to fish them using dead minnows, typically in 4-5 inch range, unless I could find bigger suckers to use as cutbait. Now that the use of live and dead baitfish is prohibited in Quebec since 2017, worms or chicken livers would be the bait of choice. 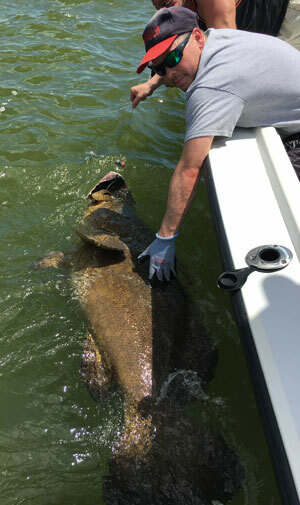 Though they aren't the prettiest fish, they pull quite hard, especially when they are in strong current, due to their big heads and strong shoulders. The rivers and waterways surrounding Montreal are filled with lake sturgeon. Most are under 50 lbs, though they can reach up to 200 lbs in this part of Canada. 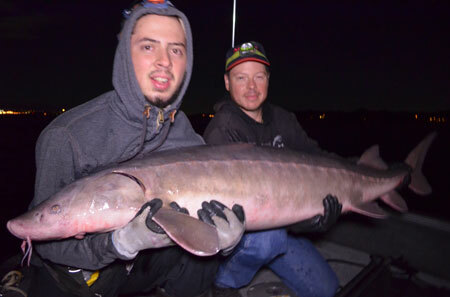 As I don't go sturgeon fishing too often, I've only caught a few. These prehistoric fish pull hard and give a great fight. I fish them using medium-heavy 7-8 foot rods with a strong reel spooled with 50-65 LB braided line. The setup is a 3/0 hook tied below a sliding sinker, stopped with a swivel about 18 inches aboves the hook. Bait used is 2 - 3 large worms hooked as a "worm ball". Unlike carp and channel catfish, sturgeon's have an extremely subtle take. Keeping a constant eye or finger on your line will improve your odds of getting a good hookset as soon as a sturgeon takes the bait. Use Wide gap or Octopus style hooks instead of circle hooks, and be sure to set the hook hard. 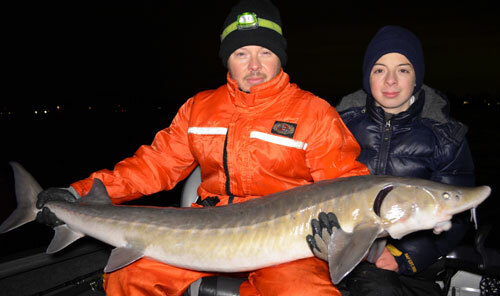 Patrick and Mark offer guided sturgeon fishing trips, contact them by clicking here. Not too many spots around Montreal have trout, and the places in the St Lawrence River are quite tough to fish to say the least, so I rarely target them. I can safely say that trout have been my least targeted species outside ice fishing for stocked trout. Occasionally, I'll head out to some smaller waterways within a couple hours drive of Montreal, throw on a pair of waders and break out the ultra light tackle to catch some for the table, as both brown trout and rainbow trout are excellent eating fish. 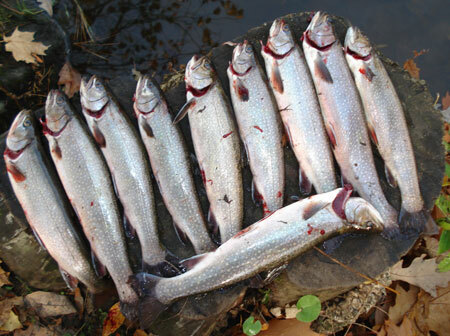 Trout can be caught by drifting worms in the current, or fishing them near the bottom. When agressive, they can also be caught on spinners or flies. Most of my bigger trout were caught fishing Rapala J5 and J7's. 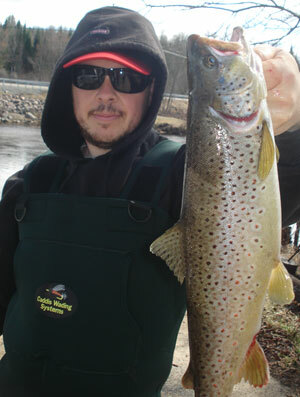 Patrick offers guided trout fishing trips, contact him by clicking here. These big salmonid inhabitants of Lake Ontario and to a lesser extent Lake Champlain, hit the surrounding rivers and tributaries to spawn in the fall. Amazing steelhead fishing is enjoyed by many Montreal residents throughout the fall and winter, provided they are willing to drive out and withstand wading in sub zero temperature. Personally, I have never been steelheading, but do plan on giving it a try in the future. 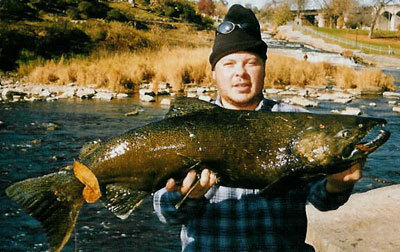 I did make it out to a salmon run once, managed a nice king on a roe sack. 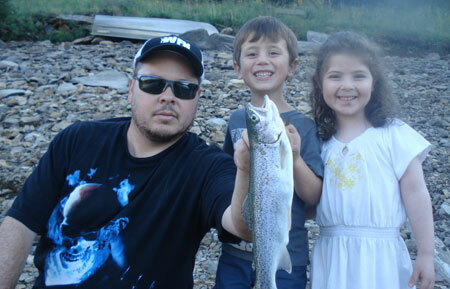 Ari offers guided steelhead and salmon fishing trips, contact him by clicking here. Another set of species I rarely target, to me the lake trout is the final frontier when it comes to trout fishing. Some of the reservoirs a few hours drive from Montreal have 25 lb+ lakers, lake Champlain has a great landlocked salmon and lake trout fishery early each spring. 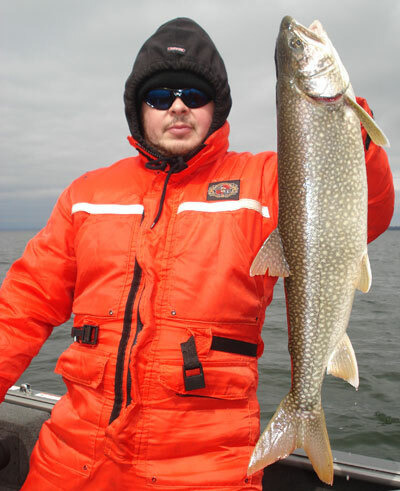 Most lake trout are caught within the first week or two after the season opener, when the water is just above freezing. As soon as it warms up a bit, they head deeper down, and catching the big ones gets a lot tougher. Landlocked salmon stay shallow for a few weeks longer. 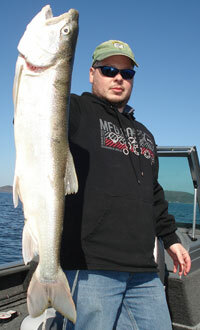 Patrick offers guided fishing trips for landlocked salmon and lake trout, contact him by clicking here. Though most of Quebec's lakes have (or had) native populations of brook trout and speckled trout, the vast majority of the provinces trout fishermen go to stocked lakes. Some stock them with the intent of having them reproduce naturally, others stock them near trophy size just to be caught for the table. The famous "Mouchetée" is probably the most sought after fish in Quebec, due to its excellent flavor. 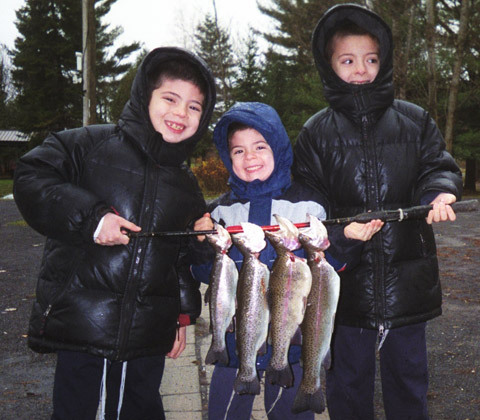 I've taken them to ice fish stocked lakes during the winter a few times, as a way to initiate my kids into ice fishing. Some outings were better than others, but they always have fun with our special version of shore lunch, barbequing our catch out on the ice. I've also taking them to stocked ponds when fishing was very slow or times was limited, as they have acquired a taste for trout. Panfish include the species that most of us started catching as kids, due to their abundance and willingness to aggressively take live bait. 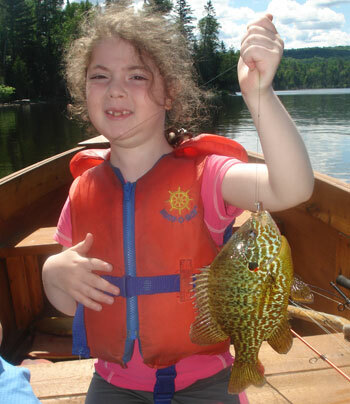 I started all my kids on Perch, Sunfish and Rock Bass, as at that age, numbers are more important than size. 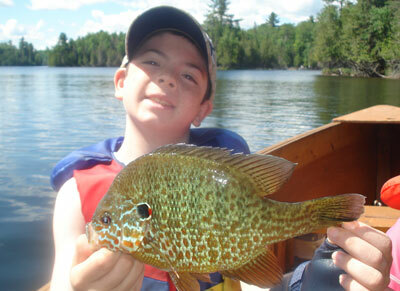 Probably the most abundant species during the warmer months, sunfish virtually guarantee non stop action for my kids. They make learning how to cast and how to set the hook tons of fun. We have both bluegill and pumkinseed sunfish around Montreal, I typically use a small #10 or #12 hook with a split shot and small piece of live worm for bait. 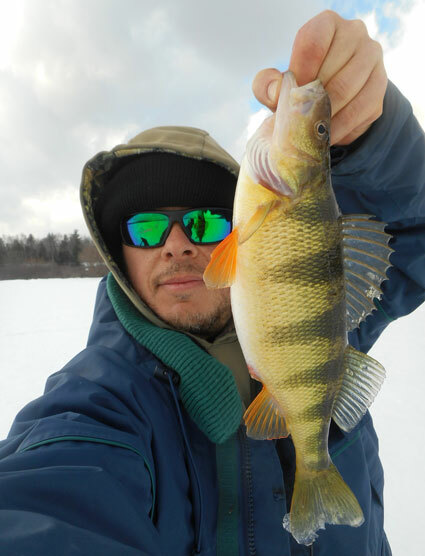 Perch are another species that are very abundant in our waterways. They are agressive 12 months a year, colder months are usually better for Jumbo perch which occasionally hit 1 lb. I typically set my kids up with the same rigs are for sunfish, but switch to smal jigging lures tipped with worm when ice fishing for perch. Perch are great eating fish, provided you have the patience to clean them. Ice fishing is the by-product of our long Canadian Winters. When November comes around, the cold North winds start to blow, the heavy rain cools the water down, the fish start getting lethargic, and most spot fisherman start going though withdrawal symptoms. Although some lucky / wealthy fisherman can afford to go south for the winter, most of us a reduced to eyeing the goldfish in the aquarium, when the thoughts of minnow hooks start to let you know that you're really about to lose it. Ice fishing is quite boring, in comparison to real fishing, but it can actually help anglers survive the 4 months that most of our waters are covered by 3 - 4 feet of ice. I started off ice fishing at outfitters, as they provide shelter, bait, hole drilling and access to thick/safe ice for extremely low rates (especially on weekdays). They stocked small lakes with decent sized trout (10-12 inches), which are a blast for the kids, and make for great shore/ice lunch. I eventually graduated to ice fishing the St Lawrence River, Lake Champlain and some other local waterbodies, mainly for perch. Eventually, I started targeting pike and walleye using bigger minnows. When ice fishing, a pair of warm waterproof boots is essential, and a good snowsuit or insulated flotation suit helps too. A gas auger really makes it easier if you plan to drill more than a dozen holes, otherwise a manual auger will do. Polar tip ups seem to be the most efficient, but ice fishing rods are more fun. These are the species that most of us don't target, but end catching incidentally. The St Lawrence River and it's tributaries are filled with big drum, gar, eels and bowfins to name a few. Occasionally, I'll have the opportunity to fish other regions for species that are non existant in our waters, typically taking a guide to learn how to target the new speices, as well as having a better chance at ensuring success. Montreal is surrounded by excellent places to fish. If you have a boat, anywhere on Lac St Louis, Deux Montagnes, St Francois or Riviere des Prairies will do. 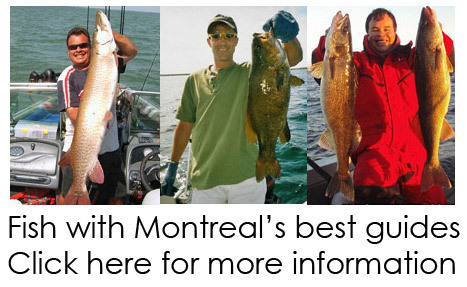 I compiled a detailed list of Montreal's most popular shore fishing spots which include some of the well known public fishing spots around Montreal, into a detailed shore fishing guide. My fishing guide contains accurate Google maps to each fishing spot, as well as information on when to fish it, how to fish it, access points, and some pictures. 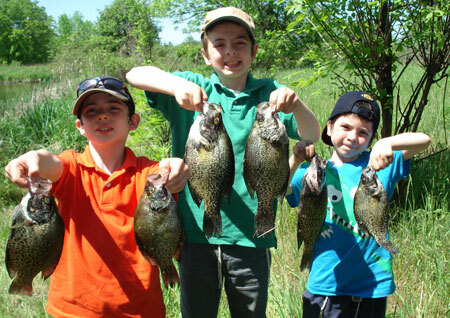 Species include Bass, pike, walleye, perch, carp, sturgeon, channel catfish, and for those of you with young children, panfish such as perch, sunfish and rock bass. Most of these spots sell bait, tackle, and fishing licenses. B&L sport on St Catherine Est - (514) 525-5354. Lachine bait and tackle - Blvd St Joseph - (514) 634-9250. Lauzon Chasse Peche - 2nd Avenue Ile Perrot - (514) 453-5018. CR Sport - hwy 20 Dorion - 450 424-4171 - boat rental as well, probably the only spot to still operate a fishing boat rental and rent boats around Montreal.